My mom's awesome. Case and point…she flew across state lines to nurse me back to good health this week. What a doll! One of the best things about having her home (bed buddy aside) are the delicious meals she makes for us. Last night we had filet mignon with roasted asparagus - I was so hungry I forgot to take a picture. And tonight she fed us Wild Caught Cod over Julienned Zucchini and Carrot Noodles. I've included the recipe below 'cause I know you're all drooling. 1. Drizzle 1 TBSP of EVOO in a medium sized skillet set on medium heat. 2. Once the oil has spread, add thawed cod filets (we use frozen filets from Costco, but fresh works just as well). 3. Sprinkle Bayou Cajun seasoning (or another seasoning of your choice) on top of fish filets. Note: Cajun seasoning has a slight punch to it, so depending on your preference you can add more or less. 4. After 4-5 minutes, flip the fish and sprinkle seasoning on top. 5. 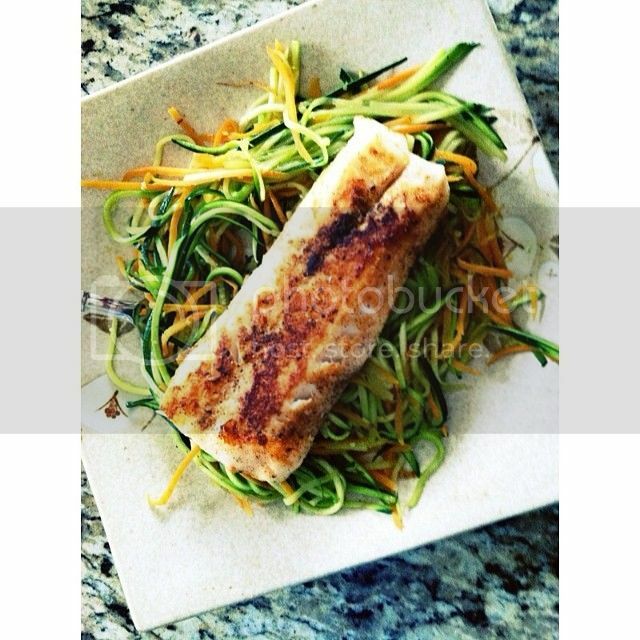 While the fish is cooking, use your julienne peeler to make your zoodles (zucchini noodles). Proceed with the carrots (coodles doesn't sound as cool). You could also use a mandolin slicer. The result will be similar but you will have ribboned noodles instead. 6. In another medium sized skillet, add the second TBSP of EVOO and, over medium heat, sautee your julienne vegetables. WATCH YOUR FISH! 7. Don't get so enamored with your colorful veggies that you forget about your cod (I've been there). 8. Remove your fish from the heat once cooked through. 9. Add minced garlic and fresh ground pepper to your vegetables and stir occasionally, moving raw vegetables to the bottom of the skillet. 10. Once your veggies are soft and noodly, remove from heat. 11. Serve your Cajun Cod over your julienned vegetables and enjoy! - It's delicious and you can season it however you like. For example, I try to avoid added salt, ergo, we added garlic + pepper to our vegetables and got a little wild with the Cajun seasoning. - It's very low in calories. 4 oz of cod is approximately 120 calories of lean protein. 1 cup of zucchini goes for about 20 calories and 1/2 cup of julienned carrots only runs you up another 26 calories. Throw in a TBSP of olive oil and you're still only looking at a 286 calorie meal. BAM. Room for dessert maybe!? - It's quick and easy. Two adjectives that don't always have positive connotations, however, when applied to your required culinary investment, take it and run. Newer PostRECIPE: It's like a breakfast cupcake…or an egg muffin.